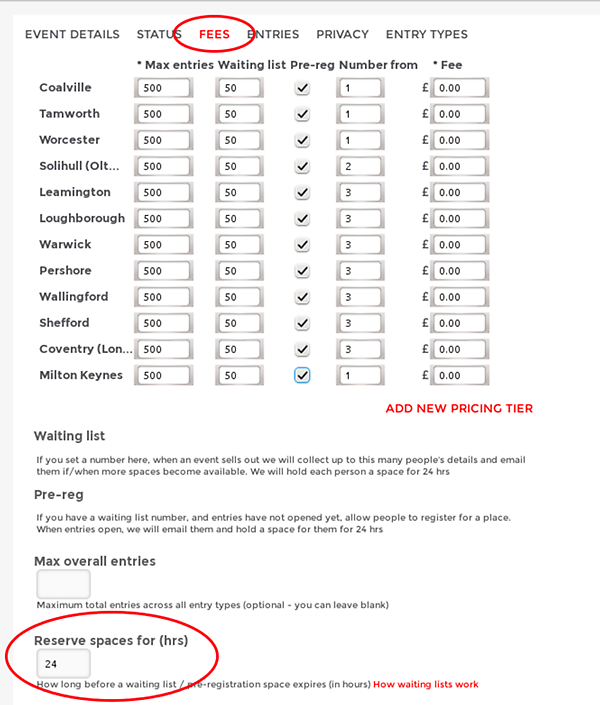 Our waiting list feature is very popular and can also be used as a pre-registration list. It's 100% automated, and easy to use. However we've had requests to be able to adjust the 'your space will expire in' time limit (previously it was always 24 hours). When an event opens (for a pre-reg list) or when a space is offered to the waiting list, entrants receive an email letting them know they have 24 hours to enter ('your space expires in 24 hours time at .. on the ...). The trade-off is that the longer you set the time limit to, the less likely the space will be filled, since in the event that the first person ignores the alert email it will take that much longer for the space to be passed on to the next in line. We think 24 hours is a good default, striking a reasonable balance between fairness to the person being offered the space and fairness to the others in the queue - but feel free to change it if a different number works better for your event.